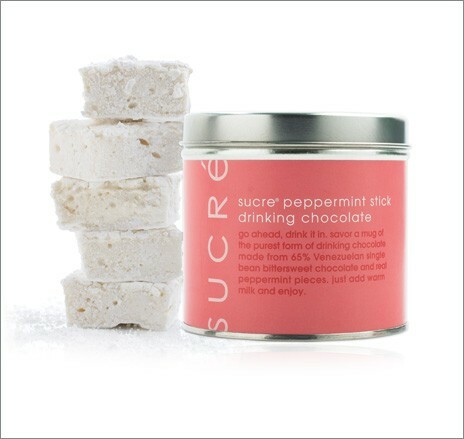 I recently received a sample from Sucre. Their holiday macaroon collection. I didn't even want to open the box it was presented so beautifully. Upon opening I was greeted with these bite size macaroons in hot pink and brown, they had a shiny finish and were topped with chocolate drizzle and candy cane. They looked too good to eat, but we ate them anyway. They were crunchy and sweet, melt in your mouth and perfectly delicate. They would make the perfect hostess gift, grandparent gift, spouse gift, stocking stuffer.. or just because gift. 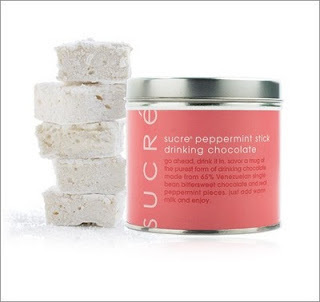 Browsing Sucre's site I came upon their peppermint drinking chocolate. I would love to find this in my sock Christmas morning. Oh how I love a good cup of cocoa. Be sure to check out all their sweets and treats, I've been more than impressed with everything I've ever tried from Sucre. I am happy to tell you that today Sucre is giving away one of their 6 piece Sugar and Spice Holiday Collections. Complete with Gingerbread Truffles, Eggnog Dark Chocolate Truffles and Candy Cane White Chocolate Truffles. They are beautiful and delicious! What Sucre delicacy would you like to try? Good Luck and Thank you Sucre! I would lovvvve to try the macarons!! They sound delish! I've never had a handmade REAL marshmallow. I get the feeling that I'm really missing out. So much on their site just sounds absolutely delicious. The Salted Pretzel Bar,The Peppermint Drinking chocolate and anything and everything else that includes chocolate! I would love to try the macaroons. Though the truffles look amazing too! mmm...macarons...they are SO hard to find! and i'm not even going to consider trying to make them since i can't even pull off a basic cookie in this rental house we're in. They all look so yummy. I think I would get some good old fashioned peppermint bark. i've never had macaroons (gasp! I, know!) And they look DELICIOUS! Those dark chocolate eggnog truffles sound AMAZING! I just made my own marshmallows and would love to try them in that drinking chocolate. Yum. it's a toss up between the macaroons and the peppermint drinking chocolate. I'd love to try the macaroons! mmm, mmmmmm, MMMMMMM! Everything looks so delish! Those macaroons are beautiful, but the thing I want to try most is the peanut butter & jelly chocolates in the Indulgence Collection. What's not to love about that combo? would love to try the new orleans collection! lived there for a while, and the cajun blood in me would love it! 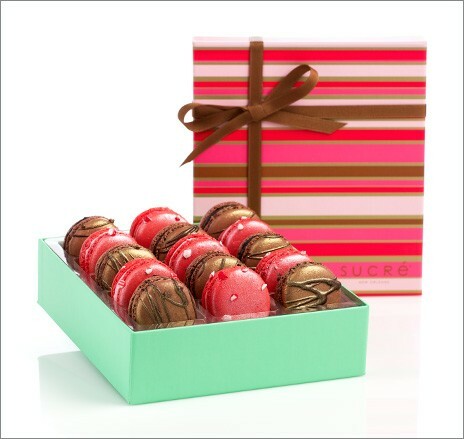 I adore macaroons, and would love to try a REAL marshmallow, too! Mmmm, I'd go for that pepermint hot chocolate and marshmallows. Looks delightful! Um, is there anything better than coconut and chocolate? I would definitely want the macaroons! The Voyage Chocolate Collection looks super yummy! i would love to try the avery collection! I want to try the macaroons! Fine. I want to try everything. the peppermint drinking chocolate sounds divine! Truffles are my absolute favorite! The no cream truffles sound amazing! Oooh! 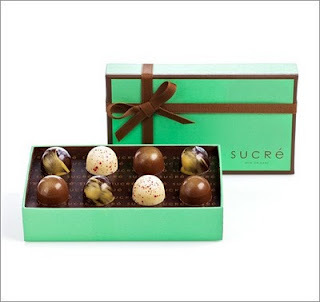 I would love the Sugar and Spice set--those holiday truffles sound delicious! I would love any of the macaroons and the vanilla marshmallows look amazing. I would love to try the peppermint drinking chocolate. It sounds so yummy! I tried macarons for the first time this summer in SF and had to run buy more before flying out. I'll love to have them again and share. Thanks! How could you go wrong with Macaroons!! This time of year I go nuts for all things peppermint. Looks like someone at Sucre has the same affliction. Mint To Be! I'd love to try the Southern Candied Pecans! i have been dreaming of macaroons for ages. oh, the macaroons for certain! love those! Ooh, the peppermint drinking choclate and marshmallows. Sounds yummy! I want to set up my tea set and enjoy those holiday macaroons! ooh, i would LOVE those macaroons! delish! Oooh, the macaroons, please. My kids love coconut!